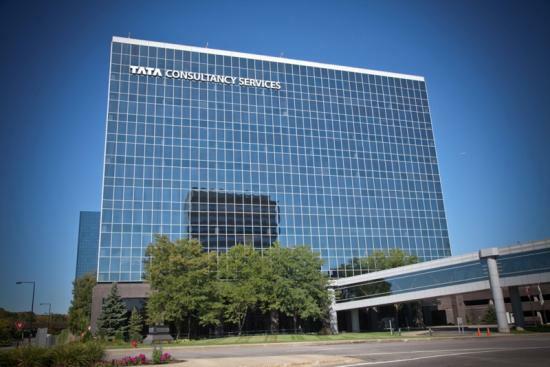 An uncertain economic environment has not deterred India's largest information technology (IT) services provider, Tata Consultancy Services (TCS), from reporting robust growth numbers and a higher target than the industry for FY14. TCS' commentary has been divergent to some of the peers when it comes to the macro environment. 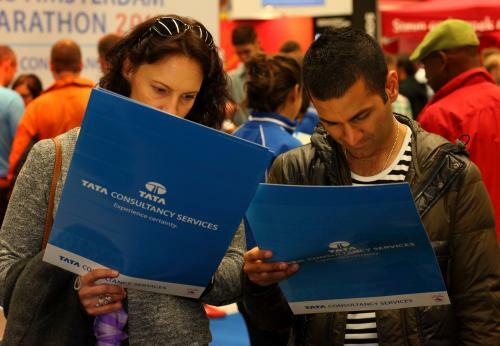 What is working for TCS? Other than the demand environment, there are a combination of things at work. We have a good strategy, that has been clearly articulated and is being carried forward and implemented. We have agile teams, which are units that are client-centric. We have a full services portfolio operating across the entire value chain, with a diversified presence. Image: TCS CEO and MD N. Chandrasekaran. All these past quarters we have had a broad-based growth. And, it has been a conscious effort to make all the segments grow (including industries and markets). When you have such a growth engine, any sudden negative surprise can be managed well. And, from a demand perspective? We think FY14 will be a better year than FY13. We are seeing a steady pipeline across geographies. We see an uptick in discretionary spends. The order book level during the quarter has been good. Decision are being made, deals are getting closed and ramp-ups are happening. So, the order book scenario going into FY14 is good. From a client perspective, we see three scenarios - clients who have increased spending, clients with a similar level of spending like last year but spending is different and, finally, there are clients which are reducing spends but taking cost out from one part of the business to other part. Image: TCS centre in Minneapolis. If we look at this quarter, growth seems to have been driven by markets like India and Latin America. Do you see mature markets to continue to be slow? In terms of constant currency, we have grown in all the markets. Yes, India has given a pop this quarter but sometimes India drops, too. It is not fair to say that India has driven the growth. We have had a diversified growth. Similarly when we do systems integration work in India, it comes with software and hardware. At the end of the day, we have to do profitable business. In a quarter where we had a 162-basis points (bps) setback between US settlement and currency, our margins have dropped only 73 bps. We delivered 4.4 per cent volume growth, with margin improvement. Image: TCS had a diversified growth in the last quarter of FY13. You maintain that margins at 27 per cent are doable. How do you see this getting impacted if the (US) Immigration Bill is passed, the strengthening rupee and wage hikes? I cannot comment on the Immigration Bill, as it is still panning out. For the rest of the factors, till they do not spike suddenly, I think we can handle these well. We have designed our business model to operate at a certain margin level. Primarily because we are in an industry that is fast-changing in terms of technology, business models, platforms and products, IP (intellectual property) investment, etc. We need the ability to invest and, hence, we need sufficient margins to be able to invest back. Image: TCS has designed its business model to operate at a certain margin level, despite the constantly changing dynamics of the industry. 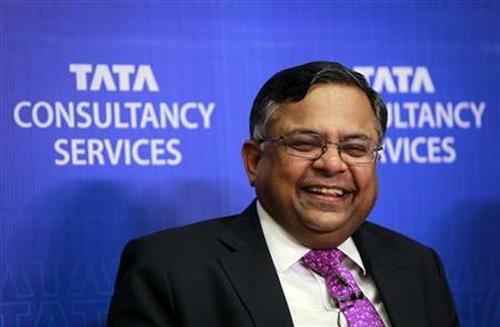 Do we see TCS becoming more aggressive in acquisitions? We are happy that we have been able to conclude the French acquisition. Some places you need acquisition, as it will accelerate growth but if you do not get the right target, then you grow organically. Going ahead, we would like to acquire in markets like Germany, Japan and even the US. In the US, I think we might want to acquire something in healthcare. Our acquisition strategy is about the right fit, right valuation and right growth potential. 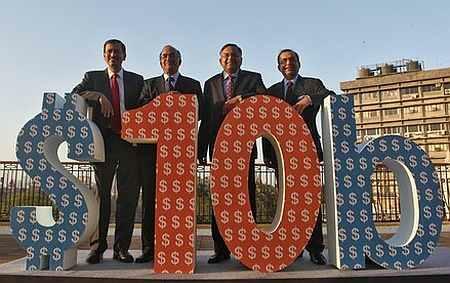 Image: Tata Consultancy Services executives celebrate the magical $10-billion mark in its turnover. How do you see TCS in the next three years in terms of revenue mix, geography spread and non-linear contribution? Non-linear will be material, in the next three years. And, we will definitely start reporting numbers. We will be a lot bigger in Latin America and the Asia-Pacific, though the US will continue to dominate. We are focused in Japan and we do see that region also becoming significant for us in the next three years. Among industries, we have scaled very well in retail, we will scale well in pharma and utilities. And, in terms of revenue, we will continue to grow. 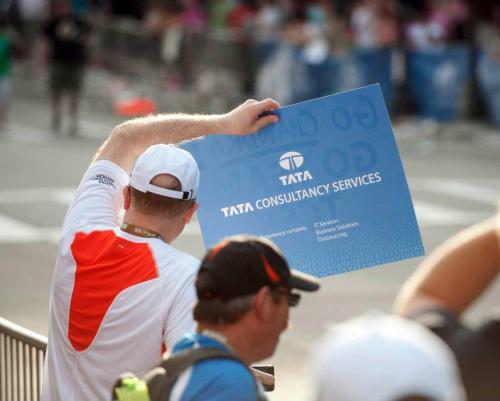 What are the key challenges for TCS? Visas (to the US) are a big concern. We need to see what the Immigration Bill has to offer. We have to analyse how the Bill pans out. Currently, it is very restrictive. And, any unexpected macro development is a challenge. 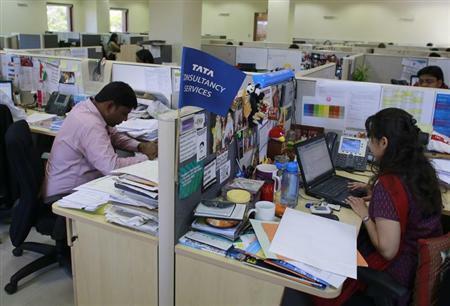 Image: Employees of TCS work inside the company headquarters in Mumbai. Are IT outsourcers promoting mini CEOs? Infosys vs TCS: Which company performed better?